Skills-development policies are needed in Latin America and the Caribbean to close the region’s productivity gap with the rest of the world, and at the same time help close the gap between those who began life with and without advantages or opportunities. This column presents the new IADB flagship report, which aims to help governments address these issues by providing detailed, evidence-based analysis of what works and what doesn’t. Latin America and the Caribbean urgently needs to tackle its lacklustre productivity growth. The first decade of this century was good for the region. Fuelled by historic highs in commodity prices, the region grew quickly and unemployment, poverty, and inequality fell. Yet, the productivity gap with the rest of the world grew larger rather than smaller (Alaimo et al. 2015). Since it is by now well known that skills are fundamental for productivity, skills-development policies must become the cornerstone of efforts to close this gap. 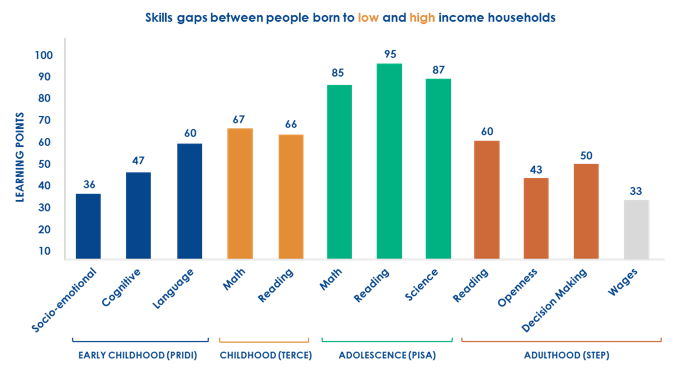 Skills-development policies should also help close the gap between those who began life with disadvantages and those who enjoyed better opportunities. Our research for the Inter-American Development Bank’s new flagship report, Learning Better: Public Policy for Skills Development, (Busso et al. 2017) aims precisely to help governments address these issues by providing detailed, evidence-based analysis of what works and what doesn’t. The need to improve skills in the region is pressing, as Latin America and the Caribbean lags not only the developed world, but also countries of similar GDP per capita in other world regions. Consider skills during childhood (Figure 1, Panel A). 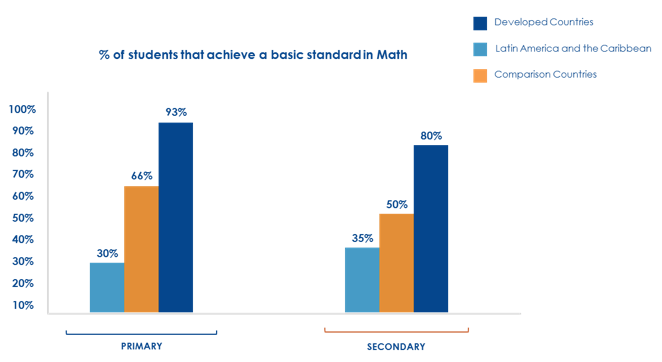 Only 30% of fourth graders in the region achieve a minimum standard of basic maths skills. They cannot add and subtract whole numbers, recognise parallel or perpendicular lines, or understand maps. In contrast, 95% of fourth grade students in the US and 66% in countries with levels of development similar to Latin America and the Caribbean reach this low benchmark. International comparisons amongst adolescents and adults show similar gaps. Note: First three surveys calculate the socioeconomic status of the child using household data on assets and dwelling characteristics. STEP socioeconomic status was calculated using the maximum level of education of the parents and controlled for education, age and gender of the person. Point estimates show difference between parents with less than primary with parents with tertiary education. A learning point is 0.01 standard deviations. Source: Panel A: PISA and authors’ calculations using TIMSS 2007 and SERCE 2006. Panel B: Author's calculations based on Regional Project on Child Development Indicators – IDB; Third Regional Comparative and Explanatory Study (TERCE); PISA; and Skills Towards Employability and Productivity Survey - World Bank (STEP). Panel B of Figure 1 shows that steep socioeconomic gradients in skills development start during early childhood and never close. A child born into a high-income household scores between 40 and 60 points higher on standardised tests measuring socioemotional, cognitive, and language skills than a child born into a low-income household. During childhood, this translates into a delay of more than a year of schooling, which widens to almost two years during adolescence. Not surprisingly, adults born to mothers with low educational levels earn 30% less than adults born to educated mothers. Skills gaps do not close in the region. Improving the skills of children and adults alike requires more than just additional investments. The Latin American and Caribbean region invested about 2% of GDP in education in 1990, well below the 5.5% that developed countries invested at the time. But investment grew rapidly. Today, the region invests around 5.5% of its GDP, on a par with the developed world, while the performance gaps remain. A well-designed public policy for skills development also demands more than intuition and theory. It requires that governments in Latin America and the Caribbean adopt an evidence-based approach to policymaking. This means using empirical results to guide decisions when weighing up different policy options. It means designing pilot projects, evaluating them properly, and scaling them up only when they prove cost-effective. Fortunately, there is a growing body of evidence on what works and what doesn’t. Since the year 2000, the number of available experimental evaluations of skills-development policies has grown from 30 to more than 1,100. To facilitate access to this important evidence, we conducted a series of meta-analyses to identify, harmonise, and summarise high-quality studies. The resulting SkillsBank web resource provides information on effect sizes of different programmes, as well as details of intervention, context, and methods. This information reveals some important conclusions. Effective skills-development policies must start today, with active workers, by identifying demand from the productive sector and translating these needs into changes in education and training systems. Firms are important actors for skills development, as more productive firms help their workers build careers and invest in skills relevant to the economy. A study focusing on Chile shows that when young workers first access the labour market through high-productivity firms, their wages grow faster than in less productive enterprises. Less-educated workers also benefit from joining highly productive firms, helping them to close their skills gaps (Busso et al. 2017). Public policy can help workers with less-favourable backgrounds access highly productive firms. Several youth programmes that bundle short training periods with internships in firms have proven to be effective in boosting access to formal jobs and higher wages, while also passing the cost-effectiveness threshold (Figure 2). However, these programs have limited scope and short internship periods. This calls for more ambitious programmes that involve longer training periods co-designed and co-executed with the private sector. Apprenticeship programmes, for example, work well in other regions of the world but have rarely been explored in Latin America and the Caribbean. Note: Each bar shows the average effect of the point estimates of different experimental evaluations of each programme. The dots show the point estimates reported in each study available (when no dot is reported, the bar shows the only treatment effect estimate available for that intervention). 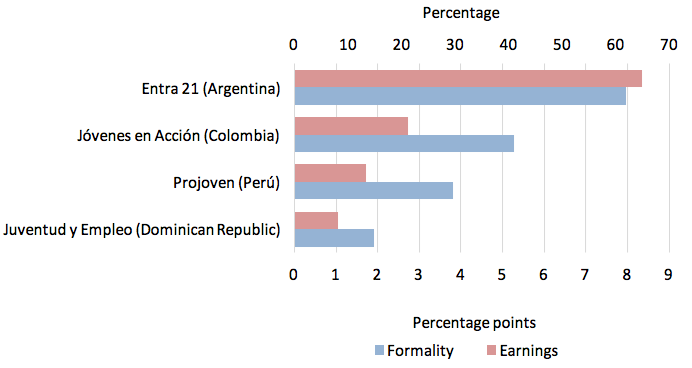 Effects on formality (earnings) are expressed on percentage point (percentage) gains from the programme. But policies should not stop at supporting active workers. Skills gaps must be attacked early, because the earlier skills are developed, the better individuals do later in life. Skills-development policies can help to improve parenting from day one of children’s lives. Such programmes are rare, but their results are promising. One well-known Jamaican stimulation study reveals how one simple intervention — health workers made weekly visits to poor families to show parents how stimulation with basic toys makes a big difference — had large knock-on effects on children’s IQ, maths, and language skills, not to mention wages later in life (Gertler et al. 2014). 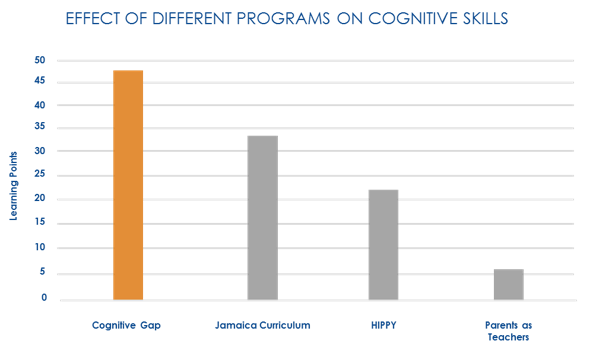 When the programme was implemented in other contexts, it again showed positive results, reducing cognitive-skills gaps between poor and rich kids by almost 70%. Other parenting programs also showed large effects at relatively low cost (Figure 3). Developing academic skills in maths and language is fundamental to many jobs and careers. Will using information on costs and benefits allow policymakers to improve learning during childhood? The available evidence suggests that it will. Over the last 15 years, governments have channelled substantial resources to three policies: reducing class size, extending the school day, and increasing teachers’ years of education. Some of these policies have been effective. Reducing class sizes from 25 to 20 students increases yearly learning by 15% in several impact-evaluation studies, whereas extending the school day from 4 to 7 hours produces a 10% gain (see Figure 4). Increasing teachers’ years of education beyond basic tertiary, meanwhile, has had no clear effect. But all three policies are expensive, requiring substantial increases in spending if implemented at scale – about 20% for class size and teachers’ years of education, and a whopping 60% for extending the school day. There are many other innovative and cost-effective policies that appear to be off governments’ radars. Non-monetary incentives – reading competitions within schools or informing students about the high returns of educational qualifications – can boost students’ effort by simple and inexpensive means with good results in academic skills. Teachers can be provided with lesson plans to save their precious time and ensure that instruction is effective and engaging, boosting student performance at low costs. Technology can be used in a guided manner during additional instruction to exploit its comparative advantages for learning. The adaptability to the heterogeneous levels of students sitting in the same class is a great asset if used adequately. All of these policies generate important increases (20-40%) in yearly learning via annual cost increases of only 2% each, and similar possibilities exist for boosting socioemotional and cognitive skills among adolescents and adults. The key point is that prioritising cost-effective interventions allows governments to improve outcomes with even limited increases in spending. But these are just a few of the many cost-effective interventions that could be implemented to boost skills. There are many more, and at every stage of the life cycle, from early childhood to adulthood, which we review in our book and the companion SkillsBank. Another swathe of promising policies also needs to be evaluated fully before knowing if they are ready to be scaled up. Of course, the size of the skills gap in Latin America and the Caribbean means that this is no small challenge. But evidence-based public policy is the beginning of the solution. Alaimo, V, M Bosch, D S Kaplan, C Pagés and L Ripani (2015), Jobs for growth, IDB Publications.